It might be getting old now, but SandForce’s 2281 controller is still used in Intel and Kingston’s SSDs, and PNY has used this platform in the Prevail Elite 240GB. It’s accompanied by sixteen 25nm Intel NAND modules, containing two 8GB dies each. That’s a total of 256GB but, as with all SandForce drives, the drive reserves an area for the drives compression technology, checking data parity and replacing faulty blocks of NAND if need be. As such, it has a formatted capacity of 223.57GB – 14GB less than a non-SandForce SSD using the same amount of NAND. The controller’s DuraWrite tech performs on-the-fly compression of compressible data when writing to the drive, resulting in the Prevail Elite’s headline sequential read and write speeds of 550B/sec and 515MB/sec respectively. However, in real-world use, data isn’t always compressible, so you’ll rarely if ever experience these speeds. However, the PNY is still quick. A sequential read in AS SSD of 515MB/sec is quicker than the OCZ Vertex 4 256GB’s 497MB/sec, and a sequential write of 315MB/sec is the highest we’ve seen from a SandForce drive. A 4KB single queue depth random write of 67MB/sec is a lot slower than the 87MB/sec of the Vertex 4, however, as are the PNY’s 4KB 64 queue depth random read and write speeds. Crystal Disk Mark showed a strong sequential read speed of 502MB/sec. the 4KB single-queue-depth read speed of 36MB/sec is also very quick, as are the 4KB 32-queue-depth read and write speeds. However, it suffers from a performance drop after a full write cycle, even after a lengthy time idle with TRIM enabled. Sequential write speeds in both ASSD and Crustal Disk Mark dropped after this, although the 4KB random performance remained unchanged. 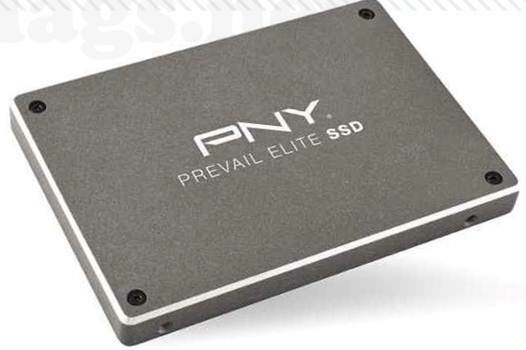 While the SandForce 2281 is quick, the PNY Prevail Elite SSD 240GB’s speed degrades after the first write cycle and it’s slower than the Vertex 4 256GB when pushed to the limit. Working out at 80p per gigabyte compared to the Vertex 4 256GB’s 63p per gigabyte, it’s poor value for money too. Samsung’s SSD 840 pro 256GB eschews its predecessor’s brushed aluminium for a more demure matt-black casing, but the main change is the new MDX S4LN21X01-8030 triple-core ARM controller chip inside. This is much like the MCX chip used in the SSD 830, but with new firmware and support for AES-256 encryption. Alongside this is 512MB of 1,066MHz LPDDR2 memory, compared to the SSD 830’s 256MB 800MHz DDR2 cache. As with most non-SandForce drives, this cache enables the SSD to run smoothly under extremely heavy loads. It uses Samsung 21nm MLC toggle NAND too. This 256GB model has 8x 32GB NAND modules on one side of the PCB, with the drive also shipping in 64GB, 128GB and 512GB capacities. Lower-capacity drives have lower write speeds, due to the smaller number of NAND dies that can be addressed at the same time. Not surprisingly, the SSD 840 Pro 256GB is significantly quicker than its predecessor. Its sequential read and write speeds in AS SSD of 521MB/sec and 498MB/sec respectively surpass those of any drive we’ve tested, and the same applies to the 4KB single-queue-depth random read and 4KB 64-thread random read and write speeds, which surpassed the SSD 830 256GB and the OCZ Vertex 4 256GB. This was mirrored in Crystal Disk Mark, where the SSD 840 pro proved significantly faster than the competition when dealing with 4KB 32-queue-depth random read and writes. However, after a few write cycles and executing the TRIM command, the drive’s speed dipped – an issue the SSD 830 series doesn’t share. Sequential write speeds in AS SSD dipped by up to 50MB/sec, while sequential read speeds in Crystal Disk Mark fell by 15MB/sec. however, these drops are fairly minor and a five-year warranty dispels any reliability concerns. The SSD 840 Pro 256GB is phenomenally fast in all our tests, but the OCZ Vertex 4 256GB costs $113 less for the same capacity, and it will be hard to tell the difference under most conditions. However, if you want the fastest SSD available, this the drive for you.